This luxury camping site has a great location. From the swimming pool guests can admire the Luberon mountain range in the distance. Just 200 metres away is the Durance river and the pretty village of Cheval Blanc can be reached in roughly 5 minutes by car. One of the main attractions of the area is the Luberon Natural Park where long hikes, bird watching and butterfly spotting can be enjoyed by adults and children alike. With LUX-camp it is easy to book a mobile home holiday in France, so select your dates and start planning. Why should I choose Les Rives du Luberon for my next camping holiday? The pool area at Les Rives du Luberon is huge. The main pool is square with lots of room to swim laps or splash around with others. A corner is sectioned off for the little ones, and there is a separate kids' pool as well. There is a wide sunbathing deck lined with sun loungers from which a clear view of the Luberon mountains can be enjoyed. A lifeguard is on duty here, and aqua aerobics is organised for guests to join in during high season. 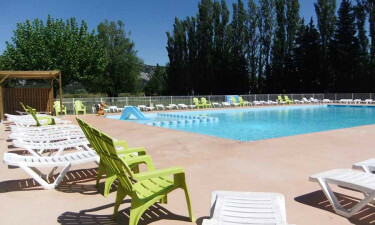 Activities based around the Durance River, the nature park and nearby canyons make this camping holiday unique. The water is only 200 meters away where fishing, canoeing and paddling are part of the fun. Cycling along the banks of the river is a great way to see the scenery too. For those who like to take long walks admiring local flora and fauna, the Luberon park is the place to go - and why not take a picnic along? Within a short drive there is a place to go horse riding and there's a course available for a round of golf as well. In high season there are activities organised for children to take part in. There is also table tennis, a pool table and a video games room, plus space to play football, volley ball and boules. Wi-Fi is available at a charge for keeping track of emails, Facebook and the news. 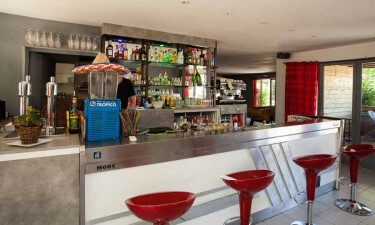 A restaurant and a bar is open in high season. There is a lovely outside terrace for leisurely alfresco drinks and luxury camping meals. An onsite camping shop has a range of everyday groceries and bakery goods in stock. The town of Cavaillon is about 8 km from the site and a weekly market sells a bounty of local fruit, vegetables, cheeses and meat which shouldn't be missed. There are also plenty of shops and restaurants to stop at as well.